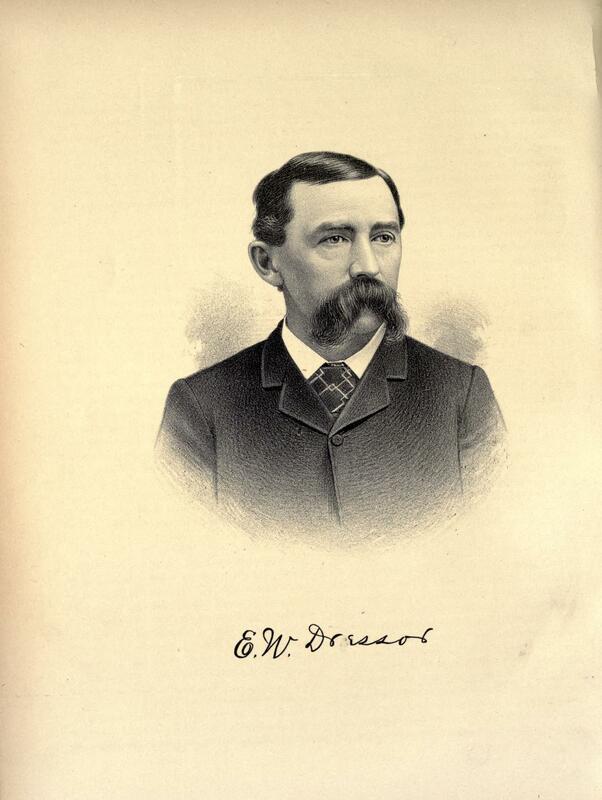 EDWIN W. DRESSOR, a prominent young farmer of Bond County, and the present Supervisor of Central Township, is located on a fine farm near Greenville, and is a man of means, intelligence and education. The parents of the subject of this notice were Nathaniel and Elizabeth Dressor, who were pioneers of Bond County. The father was a native of the Pine Tree State, where he was born in 1825. The grandfather, Rufus Dressor, was a farmer by occupation. Our subject was born near Reno, Ill., December 12, 1854. His education was begun in the best schools of the county, and at the age of thirteen be became a pupil of McKendree College at Lebanon, Ill., from which, after completing the scientific course, he was graduated June 12, 1876. His studies finished, he returned to the farm, and on March 7, 1877, he was married to Miss Mary Ann Kirkland, who was born in Montgomery County, Ill. Three children were born to this household, the eldest of whom, Orla E., is deceased. The surviving children are Edith Mabel and Blanche. Mrs. Mary Ann Dressor died October 21, 1887, and November 14, 1889, Mr. Dressor married Miss Lizzie Thraner, who was born in Bond County, Ill., October 10, 1859, and one child has been born of this marriage, Nathaniel Edwin. After his first marriage, our subject located at this place, where he has twelve hundred acres of fine land, all in one body, with the latest improvements and in the highest state of cultivation. He has carried on mixed farming, and has raised a great number of all kinds of the best stock, having an enviable reputation throughout this locality for his fine cattie, horses and hogs. He has spared no exertion in order to obtain the best grades of cattle and secure the best of improvements on his farm. Not only has he embellished his own property, but he has also advocated improvements throughout the entire township. Our subject is very public-spirited, and is always the first to favor any advanced step in the county, either in an agricultural or educational way. In his political opinions, he favors the Republican party, because he believes in that party can be found the principles best suited to the government of a great country like the United States. He is very popular in the ranks of his party, and has been honored by them in his election as Supervisor for the third term. During the first year of his service, he was elected Chairman of the Board, and so well did he perform the duties of his office that this year he was honored with the same office. The Masonic order claims our subject as one of its most honored members, and he has been most active in its meetings. He also affiliates with the Modern Workmen at Greenville. He is a man of independent means, and probably has made the major portion of his property in shipping stock and grain, both of which he buys extensively and ships to the different cities, principally Chicago and Indianapolis. He is well known throughout the community, where he is highly esteemed. 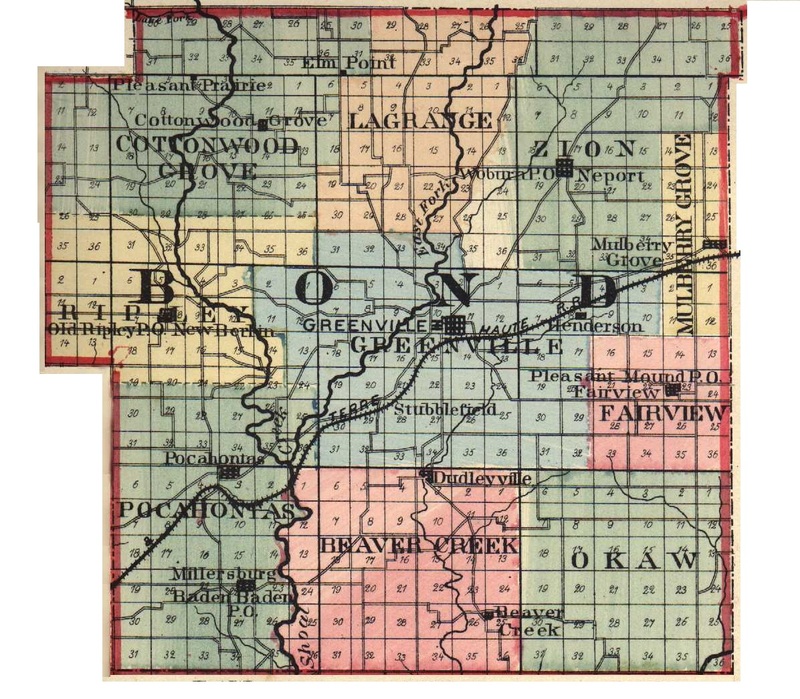 Extracted 04 Dec 2016 by Norma Hass from 1892 Portrait and Biographical Record of Montgomery and Bond Counties, Illinois, pages 177-178.